Members of Harambae perform their routine, a tribute to the gorilla that was killed at the Cincinnati Zoo earlier this year. 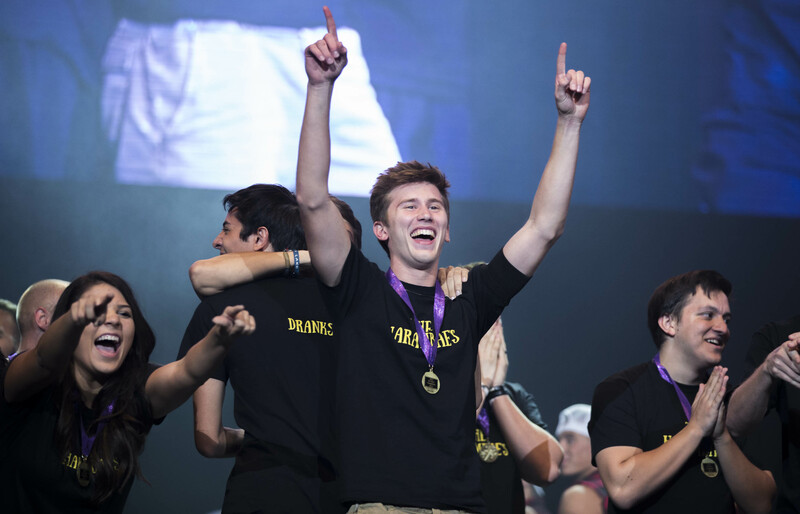 No one likes a long line, but Grand Canyon University’s annual Lip Sync talent show proved worth the wait again Wednesday night. There was no shortage of laughter in the audience. 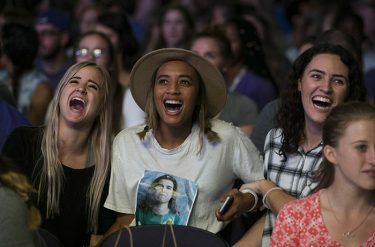 Hundreds of students waited to get into the Arena hours before the show at GCU Arena, where they would watch nine teams lip sync their favorite songs, celebrities and movie clips. The contestants were Toolbox, ID’s Please, Harambaes, Dream Team, D.R.E.A.M. Club, Terrible Stuntmen, Lope Rangers, Teardrops on Your Guitar and KidzBop Reloaded. Senior Kia Baikie sat cross-legged next to a group of students eating their dinners in line. Senior Darby Day said it’s one of the best events of the year. She and her 15 friends were lined up to hoping to get seats within reach of the stage. Members of Toolbox wore matching flannel shirts. The line was a clear indicator of what would come that night. The doors opened and the momentum continued with flashing lights, a packed arena and a DJ. Finally, the lights dimmed, the crowd stopped and a countdown began … five … four … three … two … one. Showtime. Toolbox, last year’s Lip Sync champion, was back for its third year and opened the evening with a quote from the movie “Zoolander” before showing off their electric dance moves. 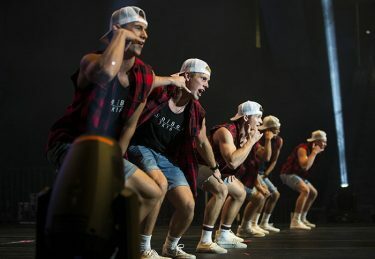 The all-boys team showcased their very own T-shirts, matching flannel shirts, jean shorts and backward hats. And, of course, they made sure they ignited the crowd, especially when they performed to “No Scrubs” by TLC. ID’s Please performed a hilarious fitness skit with mats, foam rollers, exercise weights and bands as props. ID’s Please used exercise equipment as a prop. 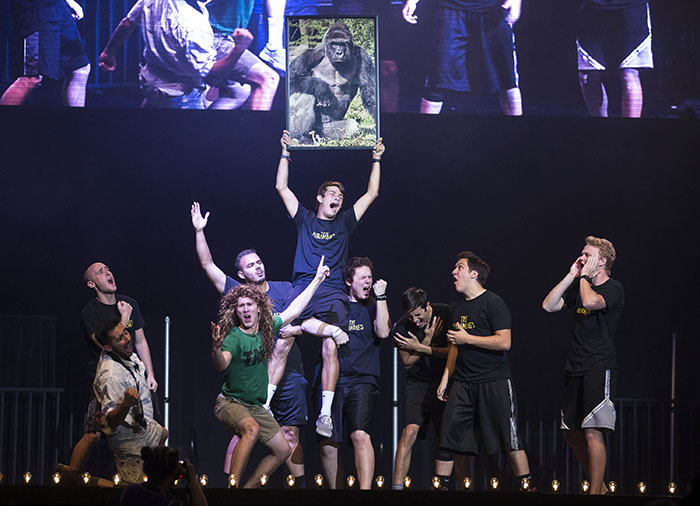 Harambae dedicated the stage to the 17-year-old male Western Lowland Gorilla (Harambe), who was shot and killed at a Cincinnati Zoo earlier this year. The 10-member crew, sporting all-black suits and sneakers, brought out a piano performance to Adele’s “Someone Like You,” and a Tarzan costume. But it was Harambe’s portrait and graveyard prop that immediately became the talk of the show. They brought the audience to their feet when they held Harambe’s portrait in the air and “I Will Always Love You” by Whitney Houston came on. Keeping the show going was host and student leader Johnny Van Ommering, who had plenty of fun outfit changes, including a cheer uniform and a mermaid onesie. D.R.E.A.M. 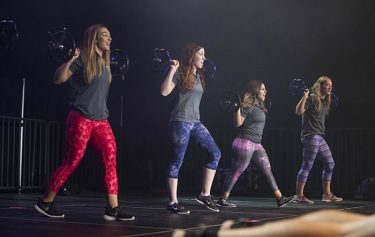 Club, a dance and sorority majorette, came together for the second year to create a strong influence of diversity and female power through performance and dance. After their performance, Courtney Clarke, founder of the team, emphasized just how hard the team practiced. Teardrops on Your Guitar was a Taylor Swift spoof. Teardrops on Your Guitar, a Taylor Swift impersonation, was playful and exciting. Lauren Iuliano, a member of the GCU dance team, played a desperate-for-love Swift with a backup dance crew. The performers made the audience scream when a student’s head was used as a podium prop as Iuliano mocked Swift’s Grammy speech, which shed light on her feud with Kanye West. There was much laughter, dancing and definite talent. Then the teams were narrowed to the top three leaving Dream Team, Harambaes and Toolbox. In the end the Harambaes won the hearts of the crowd. The team was rewarded with the title of “Lip Syncing Champion” and a trophy. Minutes after their on-stage celebration, Marko Susnjara said he was still in awe. The thing about this event is that it engages community and encourages peer support, said Julia Bates, student activities coordinator.